Fashion icon, military leader, murderer. Few women can lay claim to all three titles, but Cleopatra was no ordinary woman. Born in 30 B.C.E., Cleopatra, who ruled Egypt for 21 of her 39 years, was a woman of great beauty and style. She was also a fierce leader who craved power and control. Among many other bold actions to maintain that power and control, Cleopatra optimized her social status, femininity and charm, personally led a fleet of ships into battle and helped to organize war efforts, and took part in the death of three of her rival siblings. Having no Egyptian blood running through her veins, Cleopatra VII Theos Philopator, was born into the Greek Ptolemaic family who ruled Egypt from the time of Alexander the Great’s death in 323 B.C.E. The second daughter of Ptolemy and possibly Cleopatra V Tryphaena or Cleopatra VI Trypaena, (either woman could have been Ptolemy’s sister or cousin, it is not known for sure), the young Cleopatra showed much promise as an intellect and future leader. She studied science, literature, philosophy, and became fluent in 9 languages, including Egyptian, which the rest of her family refused to speak. While Cleopatra had the makings of a great and cherished leader, her father did not. Having allowed centralized power and corruption to flourish, Ptolemy lost control of his dynasty and fled to Rome with the young Cleopatra in tow. 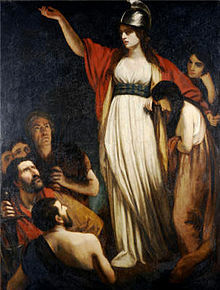 Cleopatra VI Tryphaena took control of Egypt, but died soon after, some say from poison administered by Cleopatra’s older sister Berenice IV, who then assumed the crown. With Roman support, Ptolemy and young Cleopatra returned to Egypt in 55 B.C.E. and Ptolemy had Berenice imprisoned and later executed. Soon after their return, Ptolemy died and wrote in his will that Cleopatra and her 10-year-old brother, Ptolemy XIII, would share the crown. The two married, as was common in Egyptian royal culture, and ruled together. Not wanting to share the regency with a boy 8 years her junior, and desirous of complete control, Cleopatra took the reins. She had Ptolemy’s name eradicated from official documents and had her face alone printed on Egyptian currency. The Gabiniani, powerful roman troops and named the guardians of the young Ptolemy, opposed Cleopatra’s willfulness and lust for power and ran her out of Egypt. She fled to Syria with her only remaining sister, Arsinoe. While in exile, Cleopatra’s young brother made his own mistakes, the most grievous by far, angering the most powerful man in Rome, Julius Caesar, by ordering the execution of Pompey, a military and political leader of the Roman Republic. 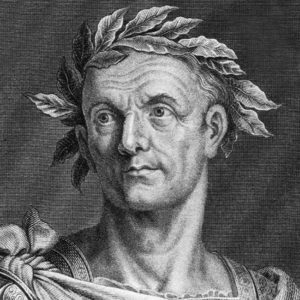 While Pompey was Caesar’s political enemy, he was also his son-in-law, husband to Caesar’s only legitimate daughter who had died in childbirth. Furious, Caesar seized the Egyptian capital and made himself arbiter between the rival claims of Ptolemy and Cleopatra. Using Ptolemy’s fatal mistake to her advantage, Cleopatra set out to gain favor with Caesar. She had herself smuggled into Caesar’s palace rolled up in a carpet, dressed in her royal finery. Enchanted with her brashness, beauty, and brains, Caesar fell in love that night. An affair developed and nine months after that fated meeting, Cleopatra had a son whom she named Caesarion Ptolemy. 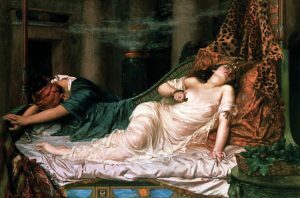 Soon after the love affair started, Cleopatra’s brother, Ptolemy XIII, drowned in the Nile, some say at Caesar’s hand with the encouragement of his beautiful mistress. Caesar then named Cleopatra’s youngest brother, Ptolemy XIV, Pharaoh of Egypt, and Cleopatra as co-ruler, and the siblings married. Caesar then set sail for Rome. Four years later, Cleopatra took her young son with her to Rome where she and Caesar rekindled their relationship, much to the grievance of the Roman people. Their loyalty lay with Caesar’s wife, Calpurnia, and they were outraged at Caesar’s blatant flaunting of his relationship with the Egyptian temptress. He even went so far as to house Cleopatra in one of his country villas just outside Rome, and also had a golden statue of her, portrayed as Isis, erected in the temple of Venus Genetrix. After the assissination of Caesar in 44 B.C.E., Cleopatra returned to Egypt to claim her title as Pharaoh. After her return, young Ptolemy XIV died, many say poisoned by his older sister. Cleopatra was known to concoct poisons and perfumes as a hobby. After her brother/husband’s funeral, she named her son as co-regent. Rich, powerful, intelligent, and beautiful, Cleopatra was in her prime when Mark Antony, a triumvir who ruled Rome after the death of Caesar, summoned her to Tarsus to incur her support of his planned war against the Parthians. In her typical diva fashion, Cleopatra made an entrance designed to impress. For the voyage she designed a golden barge adorned with purple sails and silver oars. Dressed as Aphrodite, the goddess of love and beauty, Cleopatra set sail for Tarsus determined to win over the Roman trimivir, who also considered himself the embodiment of a god; the god Dionysus. As she had hoped, Mark Antony fell for her, and Cleopatra had yet another powerful Roman leader hopelessly devoted to her. 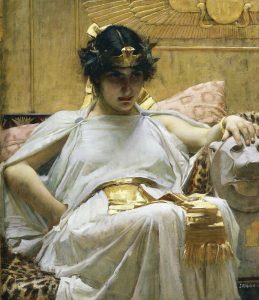 So devoted that at her urgent suggestion, Mark Antony ordered the execution of Arsinoe, Cleopatra’s younger sister, whom as the last sibling left, Cleopatra feared would attempt to take the throne. The murder took place on the steps of the sacred Temple of Artemis, a scandalous act against the temple sanctuary and thus, the Roman people. Already not in favor with Rome because of her relationship with Julius Caesar, Cleopatra further scandalized the city when she convinced Mark Antony to marry her in an Egyptian ceremony while still married to Octavia Minor, sister to his fellow triumvir, Octavian. 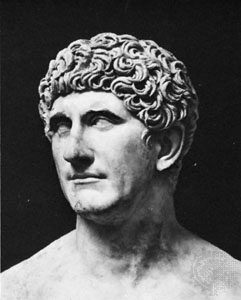 With the relationship between Octavian and Mark Antony on the brink of disaster even before Cleopatra, tensions continued to rise and in 33 B.C.E. 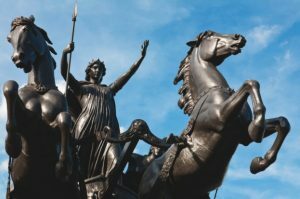 Octavian waged war against Egypt and in doing so, Cleopatra. Two years later, the conflict climaxed with the battle of Actium. Cleopatra led the charge, alongside Antony’s fleet, with dozens of Egyptian warships, but the lovers’ forces were no match to Octavian’s army. Cleopatra and Mark Antony fled back to Egypt. Their respite was not to last, and in 30 B.C.E. Octavian invaded Egypt. There are several stories surrounding the death of Mark Antony and Cleopatra, but the most popular is when Octavian invaded, Mark Antony believed he had captured and killed Cleopatra, so attempted to take his own life by falling on his sword. When his friends learned that Cleopatra was hiding out in her mausoleum, the rushed Antony, still alive, to her where he died in her arms. 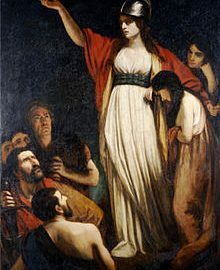 With Octavian’s rise in Roman power, Cleopatra feared she would meet a public death much as her sister Arsinoe did, so committed suicide in her mausoleum with two of her women attendants as witnesses. The most recounted story is that she had a venomous snake, the Egyptian asp, smuggled into her sanctuary and enticed it to bite her arm. Other stories claim she used an ointment, or drank wine laced with poison of her own making. 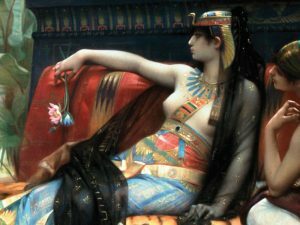 Like many of history’s empowered women, Cleopatra lived her life on the edge making bold, sometimes unpopular but always provoking decisions, taking monumental risks and enforcing change. She lived her life at top speed, she rarely looked back, and she never settled for defeat.